The PX209/PX219 and PXM209/PXM219 Series transducers are scheduled to go out of production in June 2017. 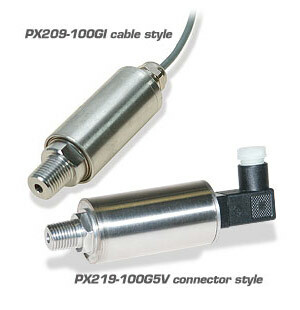 The replacements are the PX309 and PXM309 Series transducers. Please direct any Questions to Pressure Application Engineering. OMEGA’s PX209/PX219 Series general purpose pressure transducers are accurate, highly reliable pressure transducers suitable for the harshest industrial environments. The small size and lightweight of the PX209 Series pressure sensors are ideal for laboratory and scientifice applications. The unusually high performance of this solid state pressure transducer comes from the 4-active-arm-bridge sensor using a micro-machined diffused silicon diaphragm and proprietary thin film media and dielectric isolation barriers. A proprietary ASIC provides excellent temperature compensation from -20 to 80°C (-4 to 176°F), and very tight tolerances for zero balance and span. Packaged in an all stainless steel housing, PX209 pressure transducer has excellent performance and the wetted parts are impervious to many industrial liquids and gases. The PX209 is also available in metric configurations, with G1/4A ports, and models from 0-1 to 0-20 bar pressure ranges. Please see the PXM209 for complete details, or contact our Pressure department for more information. 注: Use the Part Number Builder to order.